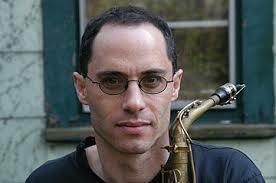 Ned Rothenberg composes and performs on saxophones, clarinets, flute and shakuhachi (an end blown Japanese bamboo flute). He has been internationally acclaimed for his solo music which he has presented for over 30 years in hundreds of concerts throughout North and South America, Europe and Japan. He has lead the ensembles Double Band, Power Lines and Sync (his current assemblage with Jerome Harris, acoustic guitar & acoustic bass guitar and Samir Chaterjee, tabla). Current and past cooperative partners include Evan Parker, Tony Buck, Sainkho Namtchylak, Masahiko Sato, Samm Bennett, Kazu Uchihashi and Paul Dresher. His playing has been featured in works by John Zorn, Marc Ribot, Steve Nieve (his opera ‘Welcome to the Voice’ alongside Sting and Elvis Costello), Marty Ehrlich and Bobby Previte. He's lived and worked in New York City since 1978. 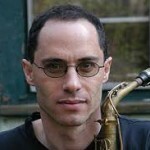 "Ned Rothenberg's compendium of finely crafted pieces (Intervals) - one album devoted to alto saxophone and the other to clarinets and shakuhachi...spring from 20 years of practiced discipline and control of solo reed performance. Rothenberg pushes sonic and spatial barriers in these essays for winds, as he explores combinations of vacillating intervals and knotty melodic kernels, and balances evolving patterns with ripe arpeggios and colorful harmonics. These tautly structured pieces seem more stories than studies and the sounds he attains are fascinating to behold.